Our democracy was under siege even before the Supreme Court’s ruling Tuesday on the Voting Rights Act. This decision caps the Court’s clean sweep on behalf of the United States Chamber of Commerce and is part of a concerted effort to seize democracy on behalf of moneyed interests. It’s a mistake to view this decision in isolation. It’s part of an ongoing, corporate-backed constitutional coup. We could decide the forces of greed are too powerful, and give up. But in a few weeks the nation will celebrate the 50th anniversary of Martin Luther King Jr’s “I Have a Dream” speech. The dream of full and equal rights is no more impossible now than it was then. The question isn’t one of possibility, but of our own commitment. Our democratic process was broken even before this week’s ruling. For proof of that we need only review the results of the 2012 congressional election, where Republicans retained control of the House despite losing the popular vote by more than a million votes. The gerrymandering and dirty politics behind that unrepresentative outcome just got a huge boost from the Court’s decision, which removed an obstacles to these kinds of assaults on the voting rights of minorities. From Citizens United to Shelby County v. Holder, this Supreme Court has spearheaded an era of unprecedented judicial activism on behalf of corporations’ and wealthy individuals’ constitutional coup against democracy. Jim Crow, meet the Koch Brothers. You have to give them this: They were smart, they were ruthless, and they had a long-range plan. First they built a cadre of radicalized and ideologically indoctrinated lawyers through organizations like the Federalist Society. These lawyers were pre-radicalized and prepared to receive judgeships whenever conservatives gained power and appointed them. Those judgeships began flowing to right-wing extremists with the election of Ronald Reagan as president. In retrospect, that adds a bitter overtone to Reagan’s racially-charged decision to give the first speech of his winning candidacy in Philadelphia, Mississippi, a city known only for the murder of three civil rights workers in 1963. That was widely interpreted at the time as a message to white Southern racists. In retrospect, it was a message to the rest of us, too. This posture allowed the Constitutional Coup’s political cadres to appoint extremist judges like Antonin Scalia to the Supreme Court and other extremists to other key Federal judgeships. They were even cynical enough to appoint the cynical, confused and arguably corrupt Clarence Thomas to the Court. The political majority seemed to sit in stunned silence as this extremist battle plan was played out. It’s as if the radical right’s opponents were unable to believe that such a bold plan was being conceived and executed, even as it played out all around them. As is characteristic of their party, Democrats essentially said and did nothing in the face of this onslaught, courteously approving judicial extremists and watching passively as Republicans blocked their own nominees. Democrats even played along by appointing increasingly timorous judges as the GOP went for increasingly aggressive appointees. That laid the groundwork for what was to come. The takeover, when it happened, came swiftly. First came Citizens United, a ruling which amplified the power of money over the democratic process. The 2012 election was followed by misguided punditry which claimed that Democratic victories in the White House and Senate proved that elections weren’t dominated by moneyed interests. Nothing could be further from the truth: The GOP retained veto control over governance, despite losing the popular vote in all three branches. Democrats in the White House and Senate aren’t even willing to argue for the majority view, much less introduce legislation that supports that view, on issues that range from Social Security (which the public wants to increase) to millionaire taxation (which the public wants increased) to breaking up the big banks. Instead President Obama is proposing to cut Social Security, has compromised on millionaire’s taxes, and is giving big bank executives a Get Out of Jail Free Card. This breakdown in democracy was well under way before Citizens United, but make no mistake: 2012 was a huge victory for the forces of the Corporate Constitutional Coup, and the Court’s ruling played a key role in that. The Court’s decision overruled Congress’ decision, affirmed as recently as 2006, to require historically discriminatory states to meet certain requirements before changing their voting laws. Those states have lost or settled far more voter discrimination rulings than others. Their majority populations have more prejudicial beliefs about African Americans on average than do those in other states. And while the Court used voter registration patterns to argue against singling out these states, Congress specifically noted that it did not consider registration the primary problem it sought to address. The Court overruled Congress anyway. In doing so, it declared a national blackout of these states’ histories of voter discrimination and prejudice – histories that included heroic sacrifices and even martyrdom to win the right to vote. As Leonard Cohen says: I’ve seen the future, brother. It’s murder. Without aggressive and un-Constitutional restrictions on minority voting, these states could quickly turn into progressive strongholds. 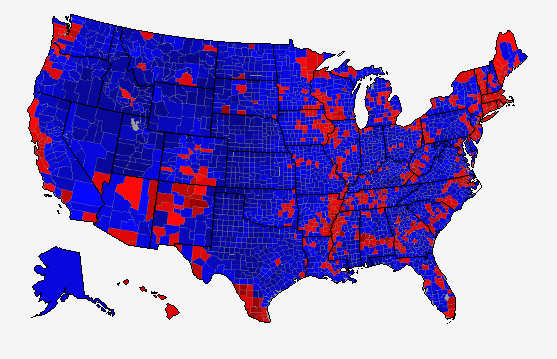 The map also illustrates the presence of white enclaves within these increasingly minority states. 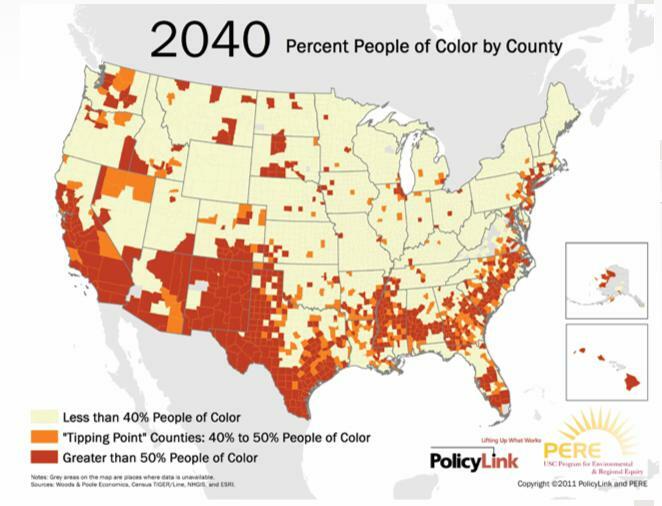 Their plan for the future is harsh, but simple: preserve these enclaves, limit minority representation through gerrymandering, and use other techniques – including “caging,” voter ID laws, and gerrymandering – to limit minority participation in democracy. They’re well organized, well funded, and antagonistic to the democratic process. That doesn’t mean they can’t be defeated. But it will take hard work. A new coalition has created a website called “Restore Voting Rights.” The National “Right to Vote” Act, announced today by Reps. Marc Pocan, D-Wis., and Keith Ellison, D-Minn., would restore some of these lost rights. The Voting Rights Act was passed, and has three times been renewed, with bipartisan support. Congress can prove that wasn’t hypocrisy, but only by supporting a new and meaningful voting rights act. More broadly, we’ll need a two-step program of education and activism. First we must understand what they’re doing and inform others about it. Then we must resist the Coup’s forces through a vigorous campaign against its elected officials and its laws. The form and nature of that campaign should be the subject of vigorous debate. But the need for it should be self-evident. There’s bitter symbolism in this week’s ruling. Dr. King was present when Lyndon Johnson signed the Voting Rights Act. Our response to this ruling will tell us – and history – whether his movement and values are still present and active in our society today. Our times are strikingly similar to Dr. King’s, as we face a digital revolution, a weapons revolution powered by drones and other killing machines, and a global revolution for democratic rights. This ruling is a clear defeat. But if we use it as a call to reengage in the struggle for our rights, it can also contain the seeds of victory.